I couldn't watch this game because all the tickets were snapped up for parents weekend on campus and this game wasn't televised because UMass is a I-AA team, a very good I-AA team at that, and that's just not worth watching apparently. The Eagles won the by a comfortable, yet unimpressive margin. Usually, when a nationally ranked team plays a I-AA team anything short of a rout keeps the team from moving up in the rankings if not dropping down in them. The Eagles, however, seem to be poised for a jump in the rankings thanks to some outside help. The #3 OU Sooners were upset by unranked Colorado, #4 Florida was upset by unranked Auburn, #5 WVU was upset by unranked South Florida, #7 Texas was upset by unranked Kansas State, #10 Rutgers was upset by unranked Maryland and #11 Oregon lost to #6 California. #1 USC barely avoided the upset against unranked Washington and #9 Wisconsin was lucky to come away with a win against unranked Michigan State. Suddenly, BC winning by a meager 10 points doesn't look so bad. With 6 of the 11 teams ranked ahead of BC losing and two more winning by slim margins against unranked opponents. There's a big top 10 shakeup coming and BC should look pretty good with it's 5-0 record intact. The Eagles should be able to maintain their spot in the top 10 if they manage to avoid the upset against Bowling Green and head into South Bend to take on a Notre Dame team that has amassed the worst opening record in ND history and slipped to 0-5 against Purdue this weekend. The Irish did show some fight in the second half, but it was too little too late. They'll try to right the ship against UCLA before taking on the Eagles and USC in the following weeks. It's also worth noting that #13 Clemson lost to Georgia Tech. This makes the Eagles the only team in the Atlantic Division of the ACC without a conference loss. It's important that the Eagles stay sharp as they finish the season with 5 conference games against @Virginia Tech, Florida State, @Maryland, @Clemson and Miami. Every one of these teams has the tools to beat the Eagles if BC doesn't bring their best game. 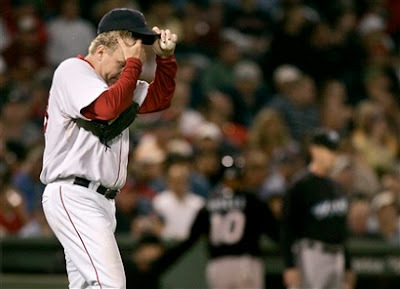 The Sox scattered seven runs over the course of the game and Curt Schilling threw a 1 run gem and the Yankees fell apart against the Devil Rays and lost in extra innings. It was nice to see the shoe on the other foot tonight. The Red Sox dominated the A's tonight at Fenway. The offense effectively capitalized on opportunities and Curt Schilling gave a promising start that seemed to say "I'm ready for the post season". Curt gave up a solo home run and scattered 6 hits. Manny was back in the lineup and put in a respectable day at the plate 1 for 2 with a walk. Bryan Corey gave up some irrelevant runs while on mop up duty in the 9th. Bringing Paps back in with a big lead would've been a waste. The Yankees again failed to clinch a playoff spot over the Tigers. This time it was their bullpen that could not shut the door with a 5-0 lead as Tampa Bay hit the grand slam to take the 6-5 lead. The Yankees again had to dig into their bullpen with another extra inning game and gave up the big hit and the win. The Tigers still have the outside shot of the Yankees losing every game for the remainder of the season and the Tigers winning every game for the remainder of the season to win the wild card, it's not likely, but I can dream can't I? It still brings a smile to my face to see the Yankees working their bullpen hard right before the playoffs. The Yankees now have five games in which they need to make up 3 on the Red Sox. I would prefer to play the Indians rather than the Angels in the post season. The Indians have been a completely different team in the second half, but the Red Sox are still 5-2 against them in the regular season and the Indians are 0-6 against the Yankees. The Red Sox have a good record against the Angels too, but not quite as good. The Angels were also 6-3 against the Yankees this year. With the curse broken I no longer feel it's necessary to go through the Yankees in the post season for me to enjoy a World Series and would appreciate it if their opponent could take them out early. 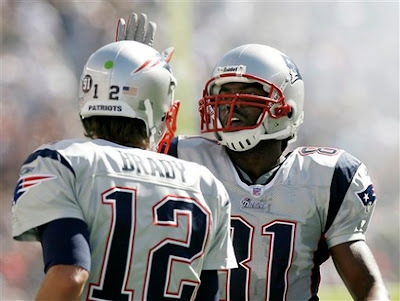 So what's the Patriots magic number? The Patriots rolled to an easy victory over the Bills 38-7 at Gillette Stadium. The Bills were a shallow team to begin with, but they have been decimated by injuries. This problem was exacerbated this weekend as Bills QB JP Losman went down on the first drive of the game. There's some controversy about whether or not this was a dirty hit by Vince Wilfork. To me, this looked like Wilfork bracing for a fall and incidental contact, but with all the recent controversy with the Patriots I wouldn't be surprised to see the league and the media give this more attention than it merits. Only Vince Wilfork will know for sure. Backup QB Trent Edwards took his first snaps and looked excellent on his first drive downfield against a potent Patriots defense. Marshawn Lynch helped with the march downfield and scored the Touchdown to give the Bills an early 7-3 lead. This would be the high point for the Bills as the Patriots put up 35 unanswered points and the bills offense would reel off one 3 and out posession after another. Despite these big numbers, there is still room for improvement for the Patriots. Tom Brady made the bonehead play of the game when he fumbled on what should have been a slam dunk touchdown at the 1-yard line. The Patriots defense had some trouble making adjustments to the Bills offense. Watching a rookie backup QB make so many big passes against the Patriots on the opening drive was embarassing. Am I the only one worried about the Patriots getting soft? Cruising to win after win with ease could lead to overconfidence, the kind of overconfidence that costs you when you play against better teams later in the year. The Patriots opponents combined record is 2-7. The quest for the perfect season isn't going to be a cakewalk with the Cowboys week 6, Colts week 9 and Steelers week 14. We all know that the Colts are for real despite close games against the Titans and Texans. Dallas has put up some amazing numbers on the offensive side of the ball and posted a solid win this weekend against the floundering Bears. Dallas is the only team to score more points this season than the Patriots. The Steelers easily rolled to 3-0 over the 2-0 49ers this weekend. Randy posted another impressive line with 5 catches, 115 yards and 2 Touchdowns. If you could get an assist in football, Randy should have gotten one for the double team he drew on the Jabar Gaffney TD catch. Randy handed the football to a young fan after his second TD catch and chose to avoid the media after the game. The Patriots head to Cincinatti for Monday Night Football next weekend. The Bengals are looking to bounce back from an embarassing loss to Cleveland where they lost 51-45 and a tough loss to the Seahawks this week. Fashion designer Marc Ecko has decided to allow people to vote on what should happen to the infamous record breaking 756 home run ball. I mentioned in a previous post that I thought somebody should put an asterisk on it and I stand by that and was glad for the opportunity to help make that happen. I've been asking myself lately why I dislike Bonds so much but can still so avidly support the Patriots despite it's own steroid scandal and CameraGate. I'm not defending what the Patriots did, but I do take some comfort in the fact that they are paying their dues for their dubious methods. Rodney Harrison has sat out some important games and will sit out some more before he can return to the field. The Patriots are also paying the biggest penalty in NFL history by getting the maximum fines and being the first team to ever lose a first round pick. There's something redeeming about paying the price for wrongdoing. This is a price Barry Bonds has not and will not ever pay and for me that makes a big difference. The wheels have come off! I don't want to overreact, but this looks pretty bad. The Yankees have made up five games in six days narrowing the lead to just a measly game and a half. Boston has matched it's longest losing streak of the year at four and hope to break out of it with an off day followed by a series in Tampa Bay. I don't want to overstate the seriousness of this. The Red Sox are still in a strong position to make the playoffs with their magic number at 3 against the Tigers and the Red Sox are bound to come out of this funk and the Yankees are also bound to cool off at some point. There are worse places to be than a game and a half up with 9 games left to play. It's also worth noting that the sox won't be playing a single game against a team above .500 or in playoff contention, not that the yankees will either. This is still a serious cause for concern. There is now officially nobody you can trust in the Red Sox bullpen. Papelbon's implosion against the Yankees doesn't look like just a bad day anymore. 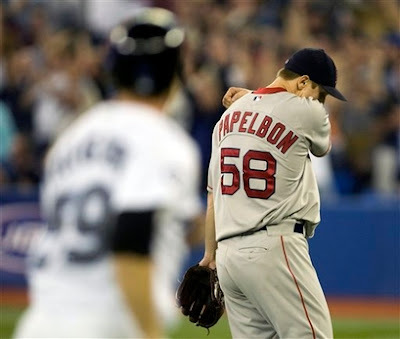 It probably didn't matter as the sox went down in order in the ninth anyways, but Papelbon giving up the grand slam killed any chance of a rally. Terry is wisely resting Okajima, but who knows if this will do the trick. Mike Timlin looked anything but sharp last night against the Jays as he hit a batter, and allowed two walks (one intentional) to load the bases for Papelbon to give up the big hit. Eric Gagne? I'm not even going to touch this one. The offense has also really struggled as of late. Last night's game Jesse Litsch allowed two hits (including the solo HR by JD Drew that accounted for the one run of sox offense) over 6 2/3 IP. This is pathetic. This is the same guy the Red Sox scored 7 runs off of in 3 1/3 IP on September 3rd. 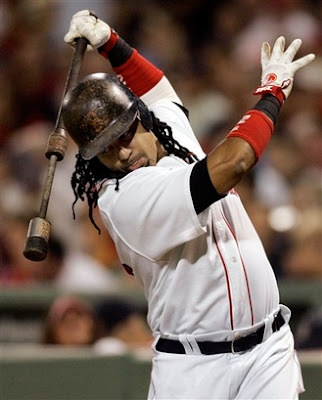 Some of this has to do with Manny Ramirez's extended absence from the sox lineup, but this dismal performance against a pitcher who is mediocre at best suggests something more. The whole offense seems to be slumping. Jason Varitek is 4 for 34 in his last ten games, two of which came in the 3-4 loss to Toronto tuesday night. Mike Lowell was 2 for 11 over the course of the Toronto series. David Ortiz went from red hot to ice cold with one hit in his last 14 at bats. I think it's pretty clear that he's hurting again, and the sox no longer have the luxury of giving him time off with Manny still out of the lineup. Dustin Pedroia is 4 for 26 in the last 6 games. I doubt these slumps will continue, and what better place to break out of a slump then against Tampa Bay late in the season after a day's rest, but it's still a cause for concern. Keep in mind, even if the sox manage to blow the AL East, they have all but clinched a playoff spot through the wild card and the playoffs is an excellent place to find redemption. The Patriots annihilated the Chargers Sunday night at Gillete Stadium 38-14. I was lucky enough to snag some tickets for this game. 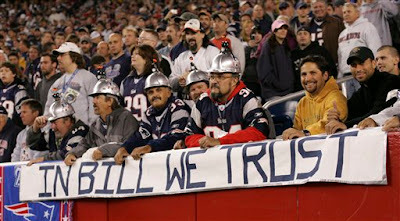 The Foxboro faithful weren't deterred by the recent "CameraGate" scandal that's been the talk of the NFL. The house was rocking as the Patriots entered to thunderous applause that managed to jump up a notch at the introduction of Bill Belichick. Belichick uncharacteristically acknowledged the support from the home crowd by waving to the fans. In a post game press conference he would mention his appreciation for their support and getting the players fired up for the game. The play on the field matched the stadium's atmosphere as the Patriots tore down the field on the opening drive to quickly gain the lead. On the next possession, Phillip Rivers would throw an interception on the first offensive play of the game giving the Patriots the ball deep in their territory. This key turnover would be fruitless as the Patriots would be unable to create a first down and missed the field goal. This was the only time where it felt like the Chargers were going to get into this game, but this would not be the case. The Patriots offense was moving the ball all game. Chargers head coach Norv Turner made some questionable decisions to punt in fourth and short situations while trailing. Adalius Thomas introduced himself to the home crowd by returning an interception for a touchdown. The Chargers would eventually get on the board, but this game was locked up by half time as the Chargers were outplayed on both sides of the ball. Loud-mouthed Chargers MVP LaDanian Tomlinson was notably quiet after his 18 carries for 43 yards day. The question of how the Patriots would handle LT was one of the few football related questions to break through amidst the "CameraGate" frenzy. The Patriots figured something out as LT was a non-factor the whole game. The Patriots really said quite a bit with this game. They showed that they are capable of competing at the highest level without the aide of videotaped defensive signals. Hopefully, this win will quiet some of the critics who feel that this recent scandal taints the legitimacy of the Patriots 3 Super Bowl championships. They also showed that the week 1 rout of the Jets was no fluke. The score was 38-14, the exact same score they had posted against the Jets the week prior, but this time against a much more highly regarded team. 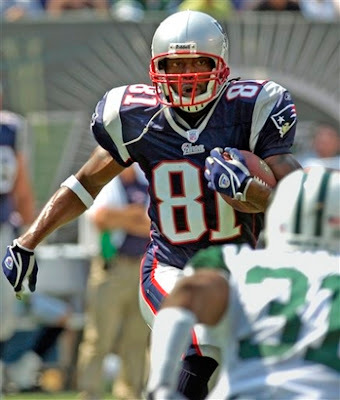 "Wide Receiver Lack of Ego: Randy Moss has scored three touchdowns this year, and each time handed the ball to the official and walked back to the sideline. Much as we're all now suspicious of New England, this improvement is not based on cheating, it's based on coaching." Seems the "Belichick Reform School for Troublesome NFL talent" is getting the job done once again. If he keeps this "great performances/low profile" thing up he's at serious risk of becoming a reliable asset to the team and a fan favorite. The AFC East is looking to be a foregone conclusion with only two weeks into the season. The Bills, Jets and Dolphins are all 0-2. Buffalo was held to 3 points against the steelers and next week isn't looking good against the Patriots. Miami had a tough loss to an underrated Redskins team, but were blown out by the Cowboys at home. The Jets are better than an 0-2 team, but Pennington still hurting from the Patriots game the week prior stood helpless on the sidelines as the Ravens beat the Jets by a touchdown. Next week's game of Miami v. Jets should prove whether both of these teams are contenders or pretenders. I really didn't get a chance to watch this whole game, but here's the things that stuck out to me. 1) Beckett pitched a great game against a good team, if he pitches at this level in the playoffs there should be at least one win you can put in the bank. 2) It's getting harder and harder to deny Jacoby Ellsbury an everyday spot on the roster with the way that he's been playing lately. Even with JD Drew's numbers climbing out of the cellar he still looks bad compared to the red hot rookie. 4) It was nice to see the Red Sox get to Wang. In his previous start against the sox Wang threw a 7 inning, 1 hit, no runs gem. The next time we'll see Wang (if we do see him again this season) it'll be in the post season, and I don't want him thinking he's got the Red Sox all figured out. 5) The Red Sox are fighters. Alot of teams would pretty down having lost in such dramatic fashion the night before, but not these sox. They came ready to play and put up the game they should have finished off last night. A 24-10 win over a ranked ACC opponent on the road is impressive enough by itself, but the score doesn't do justice to the beating the Yellow Jackets took tonight. BC had nearly double the yardage GT did, easily could have scored another touchdown on the final drive of the game and had a promising drive cut short by Matt Ryan fumbling deep in GT territory. BC advances to 3-0, all conference wins, BC is quickly becoming the front runner for the ACC championship. 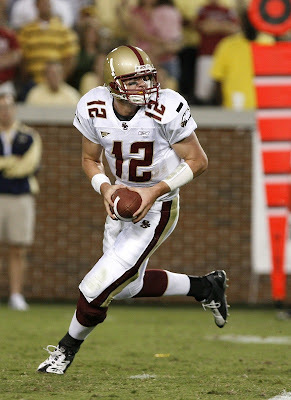 Matt Ryan added to his Heisman credentials with an impressive day: 30/44, 435 yards, a TD and no interceptions. The BC offense seemed to be marching downfield at will as the defense looked helpless against Matt Ryan's many precision passes. The defense also looked strong as they held the Jackets rushing attack to a meager 63 yards. This had a very different feel as the strengh of BC's defense in it's first two games had been it's ability to create timely turnovers, this week they did not create a single turnover, except of the 3 and out kind. It was nice to see that BC didn't need opposing Quarterbacks to make multiple bad decisions in order to win games. I think this really clarified who was the contender and who was the pretender in this matchup. Georgia Tech's 33-3 win over the Irish in the season opener looks diluted now that the Irish are 0-3 and have been outscored by opponents 102-13. 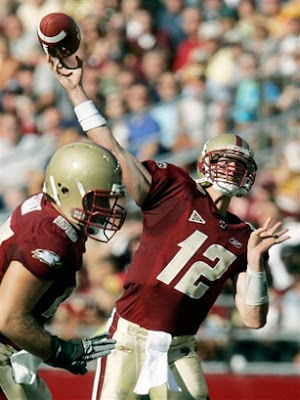 BC has likely earned their way into the top 10 in the rankings and can settle down for 3 non-conference home games against Army, Umass and Bowling Green before heading into South Bend to take on the Fightless Irish. Clemson rolled to 3-0 against Furman, no surprise there. Virginia sneaked out a 22-20 win against the Tar Heels, Virginia racks up it's second conference win and the heels start out 0-1 in the ACC. Duke finally managed to crack it's 22 game losing streak, which had been the longest in the country, in it's 20-14 win over Northwestern. Miami managed to "bounce back" from it's embarassing beating against Oklahoma last week by adding another loss onto the new longest losing streak in college football for Florida International. Keeping the underwhelming quality of Florida Intl the 23-9 victory was unimpressive. Okajima had been faltering lately, a few posts down I talked about how the long season was getting to him and he was losing his edge. Today's meltdown confirms this for me. It might be best to rest Okie, let Gagne pitch and possibly build up some confidence, give Okie some warmup appearances just prior to the post season to get him back into his rhythm and go from there. The real shocker tonight was Papelbon. Going into tonight's game he had given up two hits in August and September combined, tonight he gave up 3 hits, all his inherited runners scored and two more runs on top of that. I know Terry brought him in too early, I know expecting Papelbon to be flawless for the remainder of the season wasn't realistic, I know even closers can have a bad day but I can't help but feel stabbed in the back on this one. Of all the games for Papelbon to have a breakdown why did it have to be against the Yankees with a substantial lead going into the late innings? Everybody was ready for the Sox to come back strong in Fenway after that embarrassing sweep in the Bronx. Finally the Yankees hopes for the AL East and the references to the '78 team would be put to rest. The sox had a great chance to do that tonight. Daisuke managed to show he's still got a little something left in the tank by limiting the Yankees to 2 runs and 4 hits (Working around 5 walks! ), but this time the guys who have come through all year didn't come through. This loss goes squarely on their shoulders. There were no untimely errors, no lucky bloop hits, no lack of run support....just bad relief pitching. NFL Commisioner Goodell had reached a decision regarding the Patriots penalty for videotaping Jets signals in last Sunday's game. Bill Belicheck recieved a $500,000 fine, the Patriots organization recieved a $250,000 fine, and the Patriots will lose a 1st round draft pick if they make the playoffs and a 2nd and 3rd round pick if they do not. It's hard to determine the fairness of this penalty as there is really no precedent for this particular infraction and all penalties are completely within the discretion of commisioner Goodell. I felt like the Broncos violation of the salary cap to sign some key players to win the Super Bowl provided them with a much greater advantage than recorded defensive signs mid game could have provided but the penalty was much lighter for the Broncos as they only lost a later round pick. Fortunately, the Patriots planned ahead and have a second first rounder pick they acquired from the 49ers in this year's draft. I'm willing to gamble that pick will probably fall much sooner than the pick the Patriots would have gotten naturally. There will still be some new talent to get excited about in the off season. It's been confirmed. Greg Oden, The number 1 overall pick by the Portland Trailblazers in this year's draft, is gone for the season after having microfracture surgery performed on his knee. It's always painful to see a city pin it's hopes for a championship on one guy and then to see him go down before ever playing a minute of professional ball. This isn't "Len Bias" bad, but then again the 1986 Celtics were defending champs when they picked him up. My condolences to the Portland Trailblazers owners, players and fan base on your stillborn season. Don Orsillo summed it up nicely as the ball soared over the glove of Delmon Young to drop into the right field seats securing the Red Sox 5-4 victory. David Ortiz had built up a reputation as Mr. Clutch over the past few years. 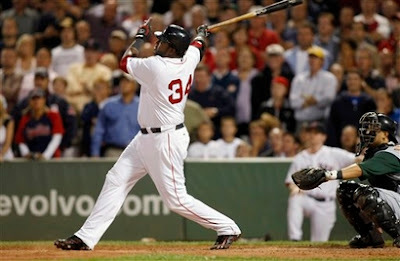 With the game on the line and Ortiz at the plate it had become an aberration when Big Papi didn't get the big hit. But this year there was something different about Ortiz. He's hurting, his power numbers were way down, his incredible ability to always come through in the clutch seemed to be gone. The 3-4-5 powerhouse of Ortiz, Manny and Drew was found lacking by the Boston faithful as all 3 are having relatively unproductive years. Ortiz proved tonight that he still has some pop left this year and can still come through in the clutch as he accounted for all 5 RBI's tonight on two Homeruns. It's nice to see that somebody on the Red Sox is hitting their stride heading into the playoffs rather than falling off of it. These last two games have been a microcosm for the Red Sox offense all year: Consistently inconsistent. The night before the sox were shut out in a one run nail biter. Tonight, the sox score 16 runs to overcome the 10 runs Red Sox pitching gave up. Tim Wakefield's knuckleball wasn't dancing as the Rays pounded him in his 3 innings of work. This left a long night and unfriendly scoreboard for the Red Sox bullpen. Kyle Snyder was unable to stop the bleeding as all his inherited runners scored on Pena's homer. Javy Lopez also allowed an inherited runner to score in his 1/3 of an inning of work. This is where things started to turn things around as the Sox came to within a run in the bottom of the fifth. Corey, Delcarmen and Timlin would all contribute a scoreless inning of work as the offense put up another 8 runs of support in the later innings. Eric Gagne would give up a run while on mop up duty in the 9th. The Red Sox offense was the exact opposite of it's performance the night before as every Red Sox hitter had a hit and all but Kevin Cash had multi-hit games. This is not surprising as the Tampa Bay bullpen is horrendous and had ample ground to cover after Tampa starter Sonnanstine only went for 3 1/3 before getting pulled. With the season wrapping up there are still so many questions about the Red Sox. They have managed to win games and still have the best record in baseball, but there are so few players that have been consistently dependable this year. The bullpen is also no longer the place where games with opponents trailing after 6 go to die. Jonathan Papelbon continues to dominate the ninth inning, but what about the rest of the bullpen. Hideki Okajima seems to be burnt out from his overuse all year long and is developing his own case of Japanese Late Season Syndrome (JLSS) as his ERA has climbed from 0.87 at the end of July all the way up to the 1.76 it stands at now. Clay Bucholz will get a chance to contribute by making bullpen appearances, but how will the rookie hold up in the post-season. I think it's also worth noting the reservations Terry Francona voiced about Bucholz when the discussion of placing him in the bullpen was brought up. "It's not just etched in stone - OK, this guy is a good young pitcher, goes from Double A, to Triple A, to the major leagues, that you throw a guy in the bullpen in September and it translates into a bunch of zeroes, I'm not sure that it's practical." "He's the type of kid that it looks to me as he works into a game can get stronger. Having a guy come in [in relief] who's never done it and throwing him in there in the eighth with a couple of men on base, I don't know how that works. I'm sure it's something we'll talk about, I just don't know the answer yet." Hardly a ringing endorsement for the "Bucholz to the bullpen plan" from the manager. Eric Gagne has managed to settle down and looks more comfortable in a Red Sox uniform, but he is still giving up runs in many of his appearances and has yet to throw a clean inning for the sox. Mike Timlin has been fairly solid ever since his return from the DL in early June, lowering his ERA from 6.23 to 3.24, but he still has the occasional implosion, like the four runs he gave up against Baltimore on August 31st. Also, at Timlin's age it definitely raises questions about his durability down the stretch. If this team were playing like it did in the first half I'd feel confident that they could beat any team in the league. The way they're playing right now? I'm not sure. "no video recording devices of any kind are permitted to be in use in the coaches' booth, on the field, or in the locker room during the game." and that "all video shooting locations must be enclosed on all sides with a roof overhead." If a Patriots employee was on the field operating a video camera then this would seem to be a fairly open and shut case. This will most likely cost the Patriots some late day 1 draft picks. I don't think that this really takes away from the Patriots victory on Sunday or the credibility of this team. There's been numerous examples of teams incurring some lesser rules infractions and continuing to have successful seasons after being penalized. The Broncos going over the salary cap with John Elway and the Steelers working out in shoulder pads in the offseason are some of the more prominent examples and both teams were similarly penalized. With any luck the Patriots will move forward from this, play a great game against the highly touted Chargers and silence some of their critics. Curt Schilling has had some solid starts recently. In his last 4 starts his ERA is a respectable 2.52. 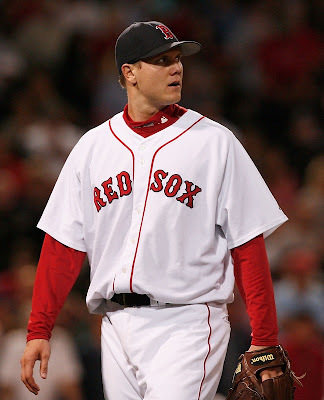 Despite this solid performance by Schilling the Red Sox have lost in his last 3 starts. Last night's game stood out as Scott Kazmir cruised through 7 scoreless innings and the Rays bullpen surprisingly managed to hold onto the slim 1-0 lead. I thought maybe the Red Sox had finally caught onto Kazmir when they finally posted 6 runs against him in Tropicana 3 weeks ago, but now it seems that was just an aberration and Kazmir is back to owning the Red Sox. The Red Sox bats looked lifeless as they scattered 5 hits and no baserunners made it past second base all game. So another solid performance by Curt Schilling goes to waste. Curt's pitching has been inconsistent all year, but to see them waste his good starts is especially disheartening. Tonight the Tim Wakefield goes up against Andy Sonnanstine. Sonnanstine's season ERA is a hefty 5.73 and 7.71 in his two games against the sox this year. Wakefield has really dominated the Rays this year. His season ERA is 4.39, but his ERA against the Rays is an astounding 1.65. Wakefield has recorded wins in all 4 of his starts against Tampa Bay this year including two shutouts in his last two starts against them. Hopefully these trends will continue. Pats able to keep up with hype! The feeling I had about the Patriots before today's game was not a good one. I had questions. How well could the defense function without Richard Seymour and Rodney Harrison? Is Asante Samuel in regular season condition after his hold out throughout most of training camp. Would Tom Brady's new fatherly duties throw him off his game? What can we expect from a Randy Moss injured for the entire preseason? Would the preseason problems with the offensive line protecting Brady come back to haunt them in the opener? I had questions and this game had answers. The defense held the Jets offense to a meager 14 points despite creating no turnovers whatsoever and were swarming around Chad Pennington all game. Tom Brady's performance was untouchable as he tore up the Jets secondary to the tune of 22/28, 297 yards, 2 TD's and no interceptions. Randy Moss really got the chance to showcase what he could do on the field as he posted 183 yards on 9 receptions and a Touchdown. The amount of time Tom Brady was allowed to sit in the pocket was incredible. He could've set up a lawn chair and had a read of the Sunday Paper with the time the Jets D-Line gave him. The only question that remains is the rushing game. Despite an impressive opening drive for Laurence Maroney, he quickly became ineffective shortly after and Brady went to the air to move the football. Even with this setback, Maroney and Morris gave some encouraging signs and were able to grind out tough yards when they needed them in short yardage situations. The Jets were hands down flattened by a better prepared and more talented team, however, I don't think the Jets are done. Chad Pennington showed some true grit trying to walk off a potentially serious injury and hobbling back onto the field to help the Jets score one of their only two touchdowns before sitting once the game became a lost cause. I get the feeling the Patriots are going to be making many of the teams on their schedule look like non-playoff teams this year. If the Jets can sort out some of the issues they're working through they could be a real threat later in the season. Plenty of surprises in the opening week. Pittsburgh made a strong statement in it's first time in a long time without Bill Cowher by pounding the lowly Browns. If the Browns don't right the ship Romeo Crennel will probably be looking for a new job at the end of this season. The Packers put up an impressive win over the much heralded Eagles. More time is needed to tell if Favre really does have another year in him or if Donovan McNabb doesn't. There was some speculation about how the Vick-less Falcons would do this year. Some felt that Vick was the most overhyped and overrated Quarterback in the NFL and that the dropoff from losing Vick would be minor. The beating they took at the hands of the Vikings would seem to suggest otherwise. San Diego won a defensive battle against the Bears holding them to 3 points all game in a 14-3 win. It will be interesting to see how the Chargers handle the revamped Patriots offense. The question this game left me with was "Is BC that good or is NC State that bad?". It's always going to be some combination of the two, but I was leaning more towards the latter. Tom O'Brien decided to stick with quarterback Harrison Beck after the dismal performance in the Wolfpack's opening game of the season against UCF. Beck wouldn't show much improvement against a razor sharp BC secondary. Beck was making risky passes all day long and managed to put up 321 yards and went 26/50 on the day, but his haphazard decision making cost him as BC picked him off 5 times, not to mention Harrison's lost fumble. A mishandled snap by the NC State punter deep in NC State territory gave the Eagles the go ahead touchdown. Giving up 7 turnovers can make it difficult to win ball games. The BC offense seemed to be upside down today with Matt Ryan being limited to 15/34 and 142 yards, a big difference from the impressive 32/52 and 408 yards he posted against Wake Forest last week. The biggest difference seemed to be with the receivers. Missed routes, dropped passes and a lack of open receivers held back the Boston College passing game. The Boston College run game which had looked so ineffective against Wake Forest managed to put itself together as Andre Callender had a breakout game with 158 yards on 18 carries and 2 TD's including a breakout run downfield for 69 yards. BC gets it's first real test as they head down to Atlanta to take on #21 Georgia Tech and try to improve to 3-0 in the ACC. The Yellow Jackets put up an impressive 33-3 win over the overhyped Irish in week 1 and pounded on Samford this weekend. If the Eagles defense can continue to create turnovers and the offense is firing on all cylinders next weekend they could definitely beat the Yellow Jackets and become a solid fixture in the top 25. Michigan continues it's downward spiral from their preseason hype as they were manhandled by the unranked Oregon ducks 39-7 in the worst loss for the program since 1968....oh how the mighty have fallen in the rankings. This was a rough weekend for the ACC as Miami was routed by the Sooners, VT proved it couldn't hang tough with a real national title contender as they were destroyed by LSU and Florida State put up an unconvincing win against UAB. It seems the ACC's 3 most prominent football programs are again having down years. Again the less heralded programs like BC, Georgia Tech, Clemson and Wake Forest seem to be gaining the credibility for the ACC. If the ACC fails to put up a real contender in a BCS bowl this year it's automatic bid could be in jeopardy. Personally, I am just astounded by this kid's accomplishment. In his second Major League start he throws a no hitter? Unbelievable. I figured between this and the Appalachian St. over Michigan game in the same day SportsCenter would explode. What I found especially impressive was how dominant Clay looked throughout the no hitter with Dustin Pedroia making the only defensively impressive play. Jason Varitek should also get alot of the credit for this gem as he more than likely called this whole game for the rookie up from Pawtucket. The big question now is whether or not Clay has secured himself a permanent spot on the roster. How do you send a kid who's 2-0 with a No-Hitter to his credit back down to the minors? I looking forward to the contribution this kid will provide to the Red Sox starting rotation. He sure made Phil Hughes and Joba Chamberlain look like second rate prospects. So how do you get mad at an offense that puts up 38 points? When the opposing defense scores two touchdowns off of sloppy turnovers, including the opening play of the season. Soon it was 14-0 after the Demon Deacons stormed down the field to put up 7 more. It was at about this time that I nearly turned off the TV in disgust and began mourning the decision to place Jagodzinski as the head coach. But Matt Ryan righted the ship and put up 5 Touchdowns as the running game struggled to establish itself all game. Dejuan Tribble carried the Eagles to a victory kicking and screaming by posting 3 interceptions, 2 of which came in the Red Zone. Pretty easy to come back when the opposing offense can't stay on the field and they rely on their defense to put up half the points. 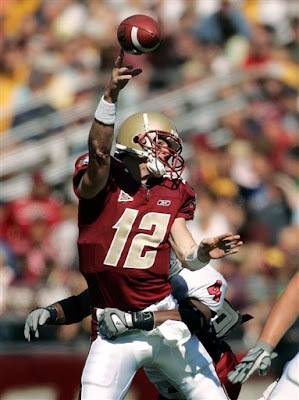 BC has set the tone with the first conference win in the ACC, but this game was extremely sloppy on offense and led me to believe that if somebody's going to put BC in the end zone it's going to be Matt Ryan and supporting a one dimensional offense is no cake walk. The Eagles will welcome our turncoat former head coach Tom O'Brien with his new look NC State wolfpack to Alumni Stadium and look to improve to 2-0 in conference play.